Are you looking for Limpopo accommodation on farms in the area? Search through our holiday rentals and find guest farms, private game reserves and game farms giving you self-catering and bed and breakfast options. The area, also known as "The Great North", is an ideal eco-tourism destination that will give you a true "Out of Africa" experience. It is a diverse landscape of bushveld, savannah, semi-desert, and subtropical vegetation. This is an area where you know you are in Africa, and one of the few remaining places in the country where wildlife teems. 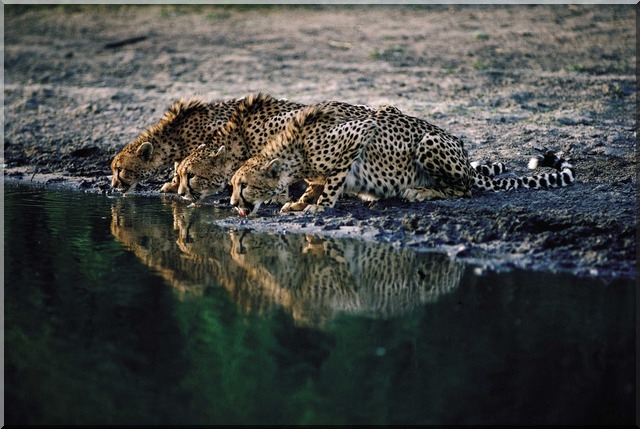 This is where the biggest concentration of cheetah can be found in the world! So bring your camera, because you are going to have some great photographic opportunities. The Limpopo Province is made up of five tourism regions - Waterberg, Capricorn, Vhembe (Soutpansberg), Sekhukhune and Mopani meaning "The Valley of the Elephants" - This is "the" place for eco tourism and conservation, with many private game reserves in the area, who all have one vision, and that is to make sure that the wildlife in South Africa is here for generations to come. So if you were thinking of taking an African Safari and staying on a game farm, or guest farm for your farm holiday, then this is the place to be. Stay in a game reserve or game farm in a thatched "rondawel", and watch the animals pass by your front door as you sit on your verandah. The best times for game viewings are early mornings and evenings as they move to the nearest rivers and waterholes. I remember staying at a lodge once where many animals past my door, but one that was really unusual was a honey badger that passed within 3 feet of me as I sat on the verandah quite late at night with the lights turned off. In the moonlight I watched as he moved through the bushveld, low to the ground with his silver back quite distinct from the rest of his dark body, foraging for food. Experiences like these, stay with you forever. The Limpopo takes its name from the great Limpopo River and the province borders Botswana, Zimbabwe and Mozambique. It is a land of ancient settlements and was once home to the famous Rain Queen, Modjadji who established the 400-year old dynasty that may come to an end due to complications to the line of succession. However, the Rain Queen has been a highly respected figure in South Africa and whose lands were never affected by warring parties. Her mystical rain making powers are reinforced by the beautiful garden that surrounds her royal compound. Surrounded by parched land, her garden contains the world's largest cycad trees which are in abundance under a spectacular rain belt. Another place that needs to be highlighted is the Soutpansberg, named for the salt pan located at its western end. The mountain range and the Limpopo River to its northern border make up this region and home to nearly 600 different species of trees. As a result, the bird life here is prolific, and it is truly an unspoilt region of the country. At the western end of the Soutpanbserg is the wild and unspoiled Blouberg Mountain & Nature Reserve that has long attracted hikers, climbers, adventurers and vulture lovers as this is reserve is home to one of the biggest breeding populations of Cape vultures. The African Ivory Route, which has its origins in the legendary exploits of early ivory hunters and gold traders, runs through the Capricorn region. Today the route is an important eco-tourism and 4x4 adventure destination much sought by those looking for that great safari experience. Have we enticed you to come to the Limpopo for your next farm holiday? Have a look at our holiday rentals on private game farms, guest farms and other farm accommodation in the area. You are sure to find something here that will suit your pocket and your budget. If you have a farm in Limpopo that you would like to showcase visit our Farm Forum. You can upload a picture and brag a little. We don't mind! Share a farming story, tell us about your best or worst farm holiday and lots more. There are other individual farming discussion boards to contribute to through this forum, as well as a Craft & Recipes Forum where you can share your favorite recipes and also get some crafting ideas for various arts & crafts. Add your Own Comments on the Limpopo Accommodation on Farms here! Have you been to the Limpopo for a holiday? What did you do, what did you see, what did you think? Come and tell us all about your holiday.